A BListItem represents a single item in a BListView (or BOutlineListView). The BListItem object provides drawing instructions that can draw the item (through DrawItem()), and keeps track of the item's state. To use a BListItem, you must add it to a BListView through BListView::AddItem() (BOutlineListView provides additional item-adding functions). The BListView object provides the drawing context for the BListItem's DrawItem() function. BListItem is abstract; each subclass must implement DrawItem(). BStringItem—the only BListItem subclass provided by Be—implements the function to draw the item as a line of text. For an example of a custom BListView subclass, see "Creating a Custom List Item". /* listItem belongs to listView. Note that you don't have to lock the list view's window to change one of its items—you only have to lock the window when you talk to the list view itself. Although much of the time all you need to draw in a list are strings (in which case you can use the BStringItem class), from time-to-time you may need to display more than a simple text string—maybe you need to display multiple pieces of information per item, or maybe you just want to jazz up the display with some icons. To change the appearance of a list item, you override the DrawItem() function to draw the item's contents however you want it to look. The following sections define the class that creates these list items. "USA", "Asia", "Eur. ", "Aust. 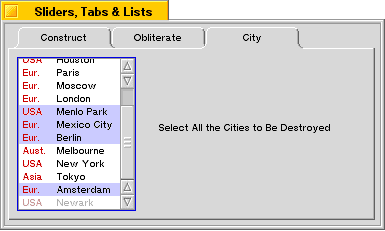 ", "Other"
A CityItem object contains two pieces of data: a city name, and a region code. The region code is used as an index into the array of region names. A BRect, which is the rectangle in which the item should be drawn. A bool, which is true if the item needs to be erased and redrawn, or false if the item's contents can be safely redrawn without erasing the current contents. If the item is enabled (selectable), we set the owner view's high color to a shade of medium red; if it's disabled, we use a lighter red color (the color definitions aren't shown). Then we use DrawString() to draw the region name:.